Arkham Horror is one of the granddaddies of board games and was possibly one of the earliest games to have included Lovecraftian themes. It’s already survived one major revision since it was first created back in the late 80s, and now, once again, the time has come to give it a much needed update, so we are now presented with Arkham Horror: Third Edition, a game that features the dreaded MODULAR DUNGEON TILES (read in the voice of BardicBroadcasts). Arkham Horror was originally created by Richard Lanius back in 1987 and was based on the tabletop roleplaying game Call of Cthulhu. 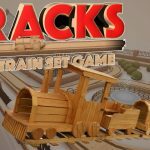 It was revised and re-released by Fantasy Flight Games in 2005 to much success and has now seen a further revision this very year by the very same FFG. The newest version was designed by Nikki Valens and Kevin Wilson (no, not the singing one), with art by Anders Finér. 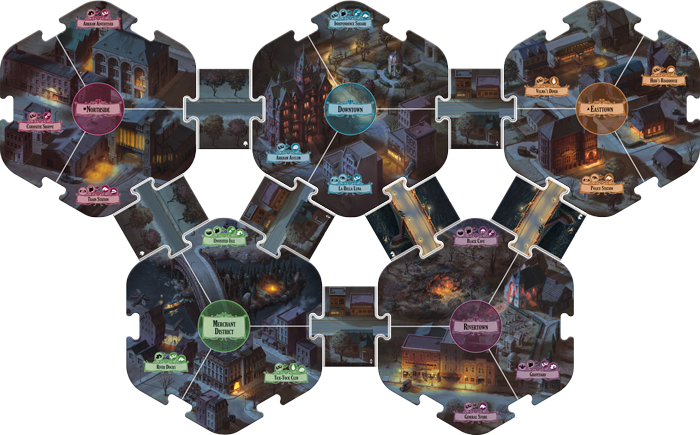 The biggest change for Arkham Horror: Third Edition is the board. 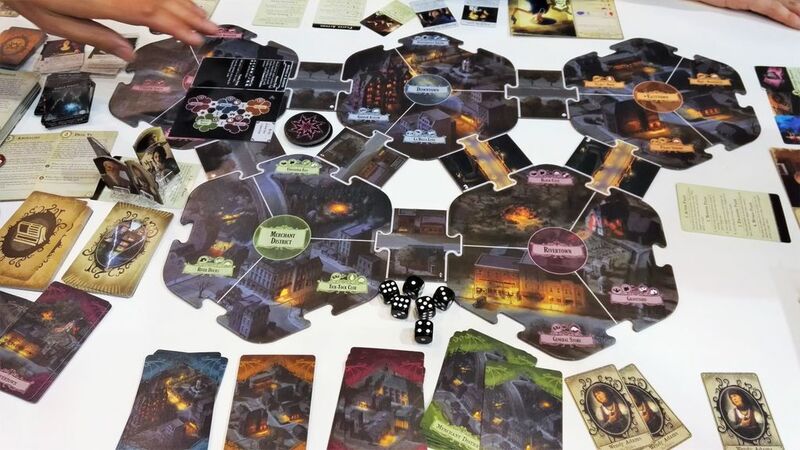 Since the first version, the game has used a single board with different locations printed on it in a similar fashion to other Arkham Horror Files games, like Eldritch Horror. The newest board is modular, featuring 5 double-sided hubs around which different streets can be placed to create many different layouts. Whether or not you like the new board design probably has a lot to do with if you played the previous versions or how much you played them. The board fits together relatively well, and it does help to keep repeated playthroughs feeling a little fresh. Of course, the map layout is tied to the scenario you’re playing, so repeating the same mission will probably feel pretty familiar. Honestly, the new board in Arkham Horror: Third Edition doesn’t change all that much, other than making the game look unique in photos and streamlining the map a little. One of the few complaints that you could make about Arkham Horror in the past is that it was a little too crowded, over-complicated and obtuse, especially for new players. So if the last few versions were a bit impenetrable, does that mean that Arkham Horror: Third Edition has done enough to change that? Well, pleasingly, the answer is ‘yes’. The rule book sets out the rules by splitting them between two books: One book teaches the basics and how to play your first scenario, while the second is a reference book that details more advanced rules you can introduce as you get used to the game. It’s a good way of keeping the more insane stuff back until people have wrapped their heads around the rules. There are probably a fair few ‘purists’ or ‘gatekeepers’ who will say that making the game less complicated ruins it, but honestly, it’s not like the complexity isn’t there anymore. The rules that get introduced as you go along are still just as complex, it’s just no longer necessary to learn it all your first time through the game. 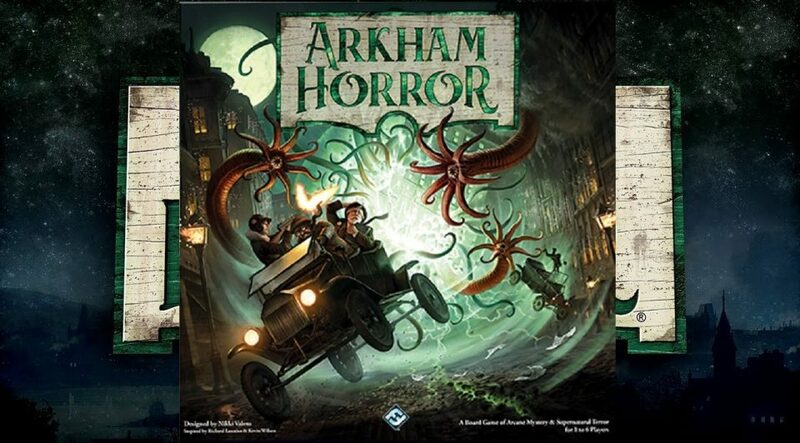 Another of the big things that Arkham Horror: Third Edition has going for it, and in this way it is similar to many other Lovecraftian games, is that it’s bloody brutal. The gameplay is split up into phases, as many games are, starting with actions, then monsters, then encounters and, finally, mythos. The action phase gets the players moving around, fighting and generally trying to solve the mystery or problem. The monster phase has monsters acting against the players, and the encounter phase is where little story vignettes play out. The mythos phase is where Arkham Horror: Third Edition really gets down to ripping the players’ hearts out through their rib cages. 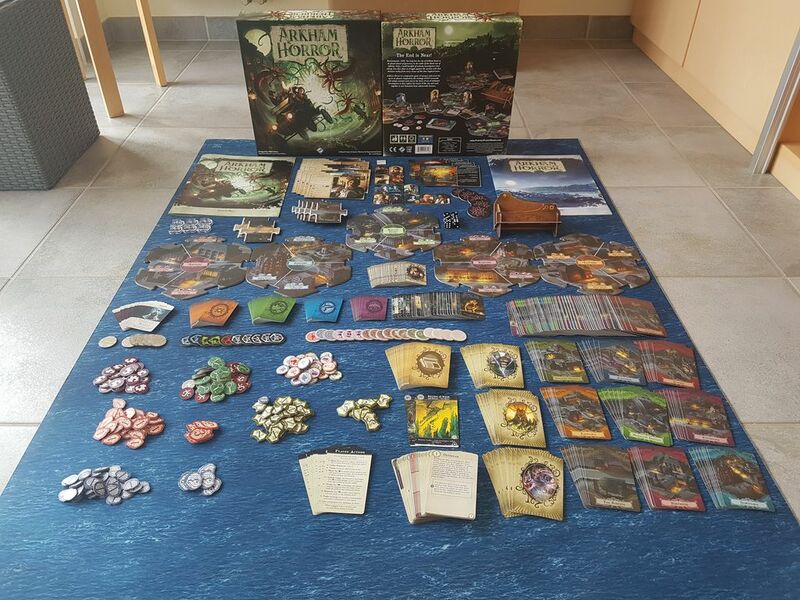 During the mythos phase, each player pulls two tokens out of a blind bag which was filled during scenario set up. On rare occasions these tokens will do nothing or will spawn clues that can help the players, but much more often than not, they will introduce new monsters, increase the amount of doom on the board and generally just make the players’ day worse. Supposedly, Arkham Horror: Third Edition does do things to help the players get through this assault. When you pick your character at the start, they all have different roles printed on the back that are there to help you decipher what each character does without having to learn the rules by heart. 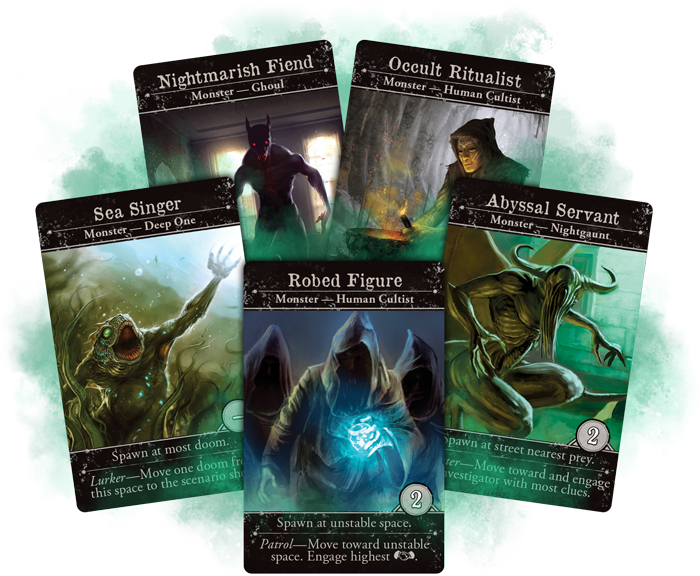 These roles are things like Mystics who deal with doom on the board, Guardians who help to protect weaker characters, and Survivors who have skills that help the players to survive the mythos phase. The only issue that this last one has is that the way the Survivor role actually helps is not immediately clear. 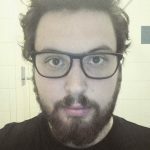 There are probably rules or abilities within the character cards that do help towards the aim of survival, but it’s kind of difficult to see through the eyes of a player just learning how the game works, let alone figuring out how to use it. We’ve mentioned a few times about the ‘doom’ in Arkham Horror: Third Edition, so to clarify, this refers to tokens that go onto the board and represent the machinations of the Elder Gods. As this doom builds, strange things start to happen, and the story is progressed in favour of the enemy. Sometimes it can be a struggle to deal with the doom tokens while trying to attain your own goals, as in certain circumstances you can get unlucky and end up with a board rapidly filling up with doom before you can do anything about it. While Arkham Horror: Third Edition is hard and can be unrelenting at times, it’s rare that a game will be completely unwinnable, at least as long as you learn how to deal with certain situations and pick the right party. About 1 in every 20 games might go so far south that you can’t claw your way back, but mostly you’re going to be able to win as long as you play your cards right (literally). The artwork is another standout, but FFG don’t really get extra points for this anymore. 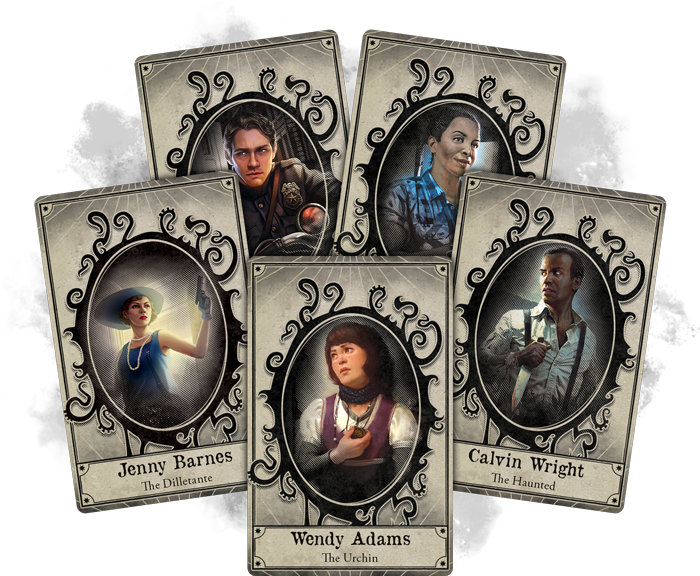 In Arkham Horror: Third Edition, as in almost all of their other games, the art is well produced to a fault and fits the dark tone and grim reality of most Lovecraftian fiction. Some of the characters included are actually taken from other games in the series too, so if anyone has grown attached to some characters, they might be in luck and be able to continue playing as them. Overall, Fantasy Flight have done a great job in updating an old favourite of the board game community. It has been streamlined and made easier to learn without compromising on either the challenge or on the complexity and depth. The artwork is of the fantastic standard that the series has always managed to uphold, and Arkham Horror: Third Edition is likely to become a classic update to a game that many people hold dearly in their hearts. For more games like Arkham Horror Third Edition, visit Asmodee or find your nearest games store. Arkham Horror: Third Edition is a fantastic update to the game that people have been enjoying since the 80s and will hopefully allow a whole new generation of players to get into it; assuming, of course, that these new players can get past the crushing difficulty that Lovecraftian games seem to be obsessed with. The artwork has the usual FFG level of polish and quality, and all-in-all this revision has done nothing but improve the game with a new streamlined learning process and map. 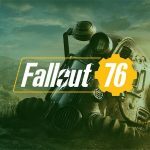 While the game is still hard, and certain character roles don't have clear uses, the game is still highly playable and is still worth picking up.